Girls Win 5th Straight State Relay Title! 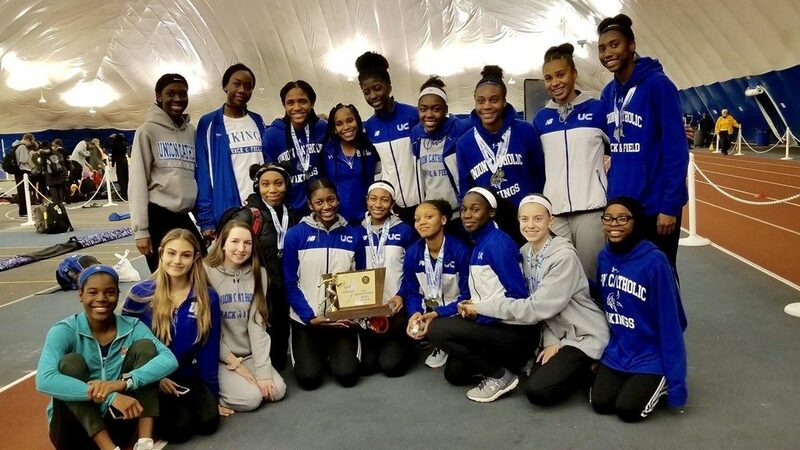 The Union Catholic girls track and field team left no doubt that they are once again the top program in the state after turning in the greatest performance in meet history at Thursday’s Non-Public A Relay Championships at the Bennett Center in Toms River. For the second straight year, the UC girls won all six races races on the track on the way to its fifth straight title as the Vikings racked up a remarkable meet record total of 82 points. The 82 points, just eight points away from a perfect score of 90, broke the girls meet record of 72 points that UC scored last year. The Vikings, who outscored runner-up Paramus Catholic by 40 points, dropped two NJ#1 times as several athletes shined. In the distance medley relay, Leena Morant ran a 2:16.6 800 leg and Jerika Lufrano anchored with a 5:04.7 carry, including a 2:25 second 800, to bring the Vikings across first in a NJ#1/US# 712:19.84 UC also ran a NJ#1 and US#7 time in the 4×800 with a winning time of 9:35.30 as Lufrano anchored in 2:19.3. Union Catholic, which also owns a NJ#1/US#2 time in the 4×400 of 3:50.93, also won the shuttle hurdles in 32.09, the 4×200 in 1:46.04, the SMR in 4:17.85, the 4×400 in 4:04.11, and the high jump. For UC, Zamira Ysaac had splits of 7.7 in the hurdles, 2:23.6 in the 4×800, and 61.1 in the 4×400. Sydney Tucker ran 60.6 in the 4×400 and 25.4 in the 4×200, Felicia Quainoo split 7.9 in the hurdles and 26.5 in the 4×200, Chi Chi Nkulume ran 58.6 for 400 in the SMR, A’Liyah Thomas ran 26.4 in the SMR and cleared 4-10 in the high jump. In the field, Angelique Williams cleared a meet best 5-2 in the high jump for UC, and Hope Handlin had the top pole vault mark of the meet by matching her PR and school record of 11-0 to help UC place second. Girls Win 1st Conference Title in School History! Previous story Boys Place 2nd at State Relays!